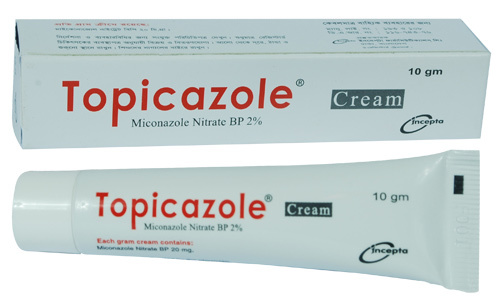 Topicazole Cream: Each gram cream contains Miconazole Nitrate BP 20 mg.
Phycomycetes, Ascomycetes and Adelomycetes (e.g. Saprolegnia, Candida, Cryptococcus, Aspergillus, Dermatophytes, Phialophora, Sporotrichum), and Trichophyton mentagrophytes, Trichophyton rubrum, Epidermophyton floccosum. Trichophyton interdigitale and Microsporum canis. In addition miconazole cream has a very rapid alleviating effect on the pruritis which frequently accompanies infection. Sufficient Miconazole Cream should be applied to cover affected areas twice daily (morning and evening) in patients with tinea pedis, tinea cruris, tinea corporis and cutaneous candidiasis and once daily in patients with tinea versicolor. If Miconazole Cream is used in intertriginous areas it should be applied sparingly and smoothed in well to avoid maceration effects. Early relief of symptoms (2 to 3 days) is experienced by the majority of patients and clinical improvement may be seen fairly soon after treatment is begun.All lesions usually disappear after 2 to 5 weeks.Prolong treatment for 10 days to prevent relapse. However, Candida infections, tinea cruris and corporis should be treated for two weeks and tinea pedis for one month in order to reduce the possibility of recurrence. Irritation, burning, maceration and allergic contact dermatitis may occur. For external use only. Avoid introduction into the eyes.